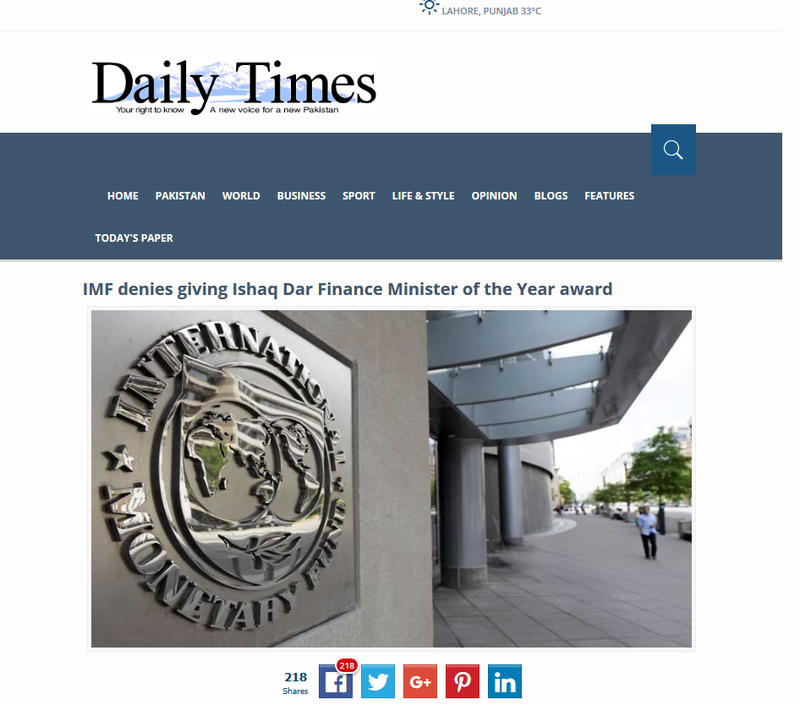 Herald Finger, International Monetary Fund (IMF) Mission chief to Pakistan, denies reports that IMF has given Ishaq Dar the Finance Minister of the year 2016 for South Asia award. IMF took notice of the situation when finance ministry released a communiqué on 8th October which stated that Emerging Markets, the newspaper of the IMF / World Bank Annual Meeting, has declared Senator Ishaq Dar as “Finance Minister of 2016 for South Asia”. “The Award is recognition of Pakistan’s economic performance at the IMF / World Bank Annual Meeting which is one of the major gatherings of international financial and economic leaders and experts. The finance minister has authorised Pakistan’s Ambassador to the United States, Ambassador Jalil Abbas Jilani, to receive the award on his behalf,” the press release of the ministry read. 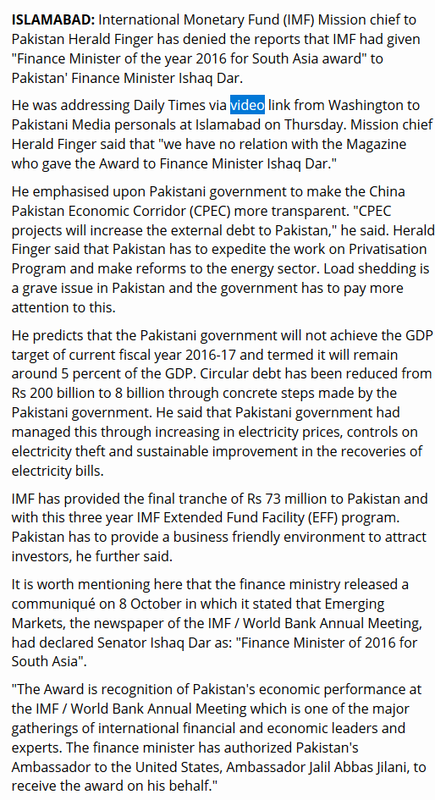 Herald addressed newsmen via video link on Thursday in which he explained that IMF has no links with the magazine “Emerging Markets”. Herald further stated various reasons indicating why Ishaq Dar is not a likely candidate to win the award. He stated that unless the China Pakistan Economic Corridor (CPEC) isn’t made transparent, it will lead to an increase in external debt of Pakistan. Load-shedding issue was also raised along with reforms which are needed in the energy sector. Kahan he wo Jahil jo Well Done Ishaaq Dar ker rahe the. Ishaq Dar ke policies ne pori awam ko karzo me dubo diya ha uske bawajood ye Jahil awam Well done Nawaz Shareef or Ishaq Dar ke naray lagatay hein. Joto ke haqdar he patwari league. Mujhe tou pehle hi yaqeen nahi araha tha k aisy munshi ko award mil sakta hai. It is really a shocking news for me that disowned by the IMF… However, Darr, Finance Minister, is really a brilliant and intelligent minister…. he has wisely controlled all monetary affairs…. it is his struggle and plans that inflation rate is stable…. All the prices on goods, vegetables, pulses are also stable for a long time… Even daily Imran khan staged the rallies and speech functions closing the main chokes of the cities and due to his such activities the economy of the country should go down but it is actually the wisdom of Darr sahib who has controlled the price hiking and economy … As he has boosted the industries of the country i dont think any minister has boosted it in the way as he is performing… so there are so many things which go on his credit .. these were very few performances which i mentioned above…. Wah Azeem bhai, kia tareef ki hai aapne Azeem Dar Sahab ki. Aap sahi keh rahe hain yeh IMF ki hi galti hai jo itni Azeem shaksiyat ko disown kar dia. Good one KMQ. But be careful tumhare duplicate aye huwey hain market main aaj kal. Nakaloon se hoshiyaar! Tum ne nahi lekin hum KMQ ka nick kisi aur ko use nahi karne dainge. Copyright hi samjho yar. Woh tumhara hi nick copy kar raha hai, we all know that. He want to be famous like u but duplicate duplicate hota hai. Jaise Ishaq Dar ka yeh award jaali hai woh KMQ bhi jaali hai. Woh bhi expose hoga aisey hi. Seems Mr Azeem is working from his office in Raiwind where they have employed people at public money to lick the boots of Sharif family…. Traitors. So, How would you justify the lie told by the govt.? The only award i remember for Ishaq dar was full slap on his face by a person i know very well. This m0r0n Ishaq dar really deserved it. Iska best manipulator of the Asia ka award banta hai. Bohat heera pheeri ki hai ishaq daambar ney. AISAU JHOOT PAR LOG RESIGN KR DETAY…AAHHH JO PANAMA PAR….